Unbeaten WBO junior bantamweight champ Naoya Inoue (10-0, 8 KOs), 115, retained his belt in his second defense when he dropped #1 David Carmona (17-2-4, 6 KOs), 114, from Mexico, with furious combinations in the final session, had him on the verge of a knockout and pounded out a unanimous decision on Sunday in Tokyo, Japan. The official tallies were as follows: Eduardo Ligas (Philippines) and Sawaeng Thaweekoon (Thailand) both 118-109, Ramon Cerdan (Argentina) 116-111, all in favor of the 23-year-old defending champ. The referee was Eddie Claudio (US) who worked well to handle the fast-moving contestants. It was such a one-sided affair that Carmona, 26, showed only his heart and durability against the formidable titlist. Naoya finally caught up with the game Mexican with a last surge, badly dropped him close to a knockout, but Carmona barely stood up and resumed fighting. Should the third man have been Richard Steele, it would have been halted even with some seconds remaining in the final stanza. But Carmona managed to last the distance as he gamely withstood Inoue’s continual and constant attacks. We truly praised his tremendous gameness. The first round saw Inoue almost bring home the bacon with very vicious overhand rights to the face of the bewildered Mexican, who barely endured the champ’s opening attack with his high and tight guard. Utilizing left jabs to probe the cautious challenger in rounds three and four, Inoue took the initiative and scored with left-right combinations and solid left hooks to the face. Inoue, in the fifth, went out for a kill as he furiously accelerated his attack upstairs and downstairs, sending him backward from pillar to post. Carmona showed his great endurance by covering himself up with both hands and attempted to fight back gamely. It’s Carmona that turned aggressive not to have the fight stopped in the sixth, when Inoue effectively retaliated with solid left hooks and right crosses with precision. The champ was also in command in the seventh, throwing good jabs and crisp rights to the side of the belly. Only one round that Carmona apparently took was the eighth, when Inoue had the Mexican release punches to have himself on the defensive in order to find good openings to counterpunch with right timing. Inoue kept only jabbing without throwing solid shots in this session to save his energy and draw Carmona’s attack to have him open for counters. The eighth was also taken by the champ who kept throwing jabs and left-right combos against the shell-guarded Mexican. The tenth witnessed Inoue become a Muhammad Ali, beautifully circling and jabbing with his swift footwork to attract the audience. The champ repeatedly landed strong rights to the side of the belly to have him wince upon his absorption. Inoue, though admiring Carmona’s gameness and toughness, patiently kept jabbing and landing one-two combinations to the swollen face of the challenger in the eleventh. 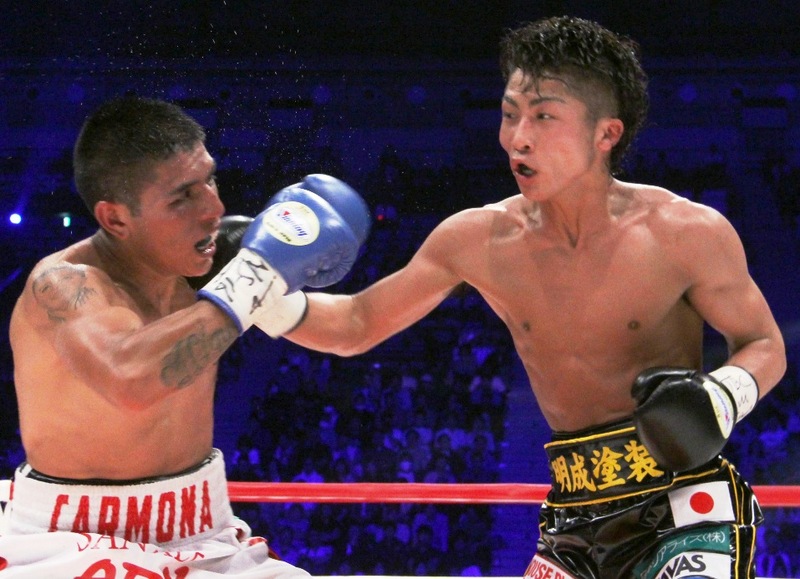 The climax visited in the twelfth and final round, when Inoue finally turned loose with all what he had, and battered Carmona from all angles and had him reeling to the ropes. Connecting with very solid combos, Naoya at last decked him on all fours. Carmona amazingly pulled himself up and kept on fighting without surrender, and the final bell mercifully came to his rescue. It was our disappointment that we failed to watch Inoue’s greatly anticipated victory by a knockout, but his fierce attack in the final round may prove his abundant stamina and power as well due to his youth and hard training with his father/trainer Shingo. Inoue, regarded as a Japanese Wilfredo Gomez, failed to score all knockouts in his title defenses, as Bazooka registered seventeen defenses all within the distance. But it might be a good lesson for the young champ, just in ten professional bouts after his debut in 2012, that he faced such a tremendously durable opponent as Carmona. It was Japanese Fuji Television rather than Carmona that was afraid of Inoue’s too quick demolition and seemingly was happy to show nationwide the dramatic knockdown in the final session.